Binoculars are great devices to have for bird watching. Even though the saying that if you want better quality then spend more is kind of true in the binoculars world, however, not everybody has got big money to spend some times. But does that mean bird watching is only for those with big money?. Absolutely not. That is why I have done some research and have come up with some of the best budget binoculars for birding that won’t break your bank account. All of these birding binoculars I have listed below deliver good images and have a great field of view and guess what?- they are less than $200. Now you can also enjoy bird watching and other outdoor activities with more confidence and love. Before I go into detail review of each bino, let’s have a look at some tips to help you choose the best budget binoculars for bird watching. Whether you are a beginner or a pro, you might find them helpful. These tips will guide you to select the best binoculars for your bird watching adventure. Birds can move very fast from one point to the next. Whether it is flying or hopping from one tree to the next. You will next binoculars that can allow you to hold them steadily or change positions easily to view birds effectively. Most people prefer between 8x and 10x binoculars. This is a personal choice. General the higher you go in magnification, the narrower the field of view and less steady your binoculars will be. Hence the standard magnification for birding is the 8x and 10x binoculars. If this power range, you can get clear images and good enough field of view without your handshakes been noticeable through the images. A wider field of view(FOV) is often preferred over narrow FOV. Birds can move very fast and your binoculars should be able to capture a wider area for you to easily track their movements. 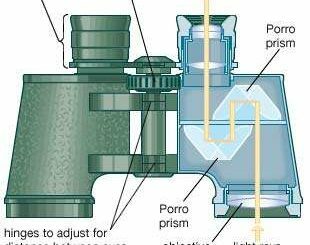 The brightness of binoculars is primarily governed by the quality of the lens, prisms, coatings, the objective lens diameter, and the magnification. Larger objective lens results in brighter images and also work well in low light conditions but also makes your binoculars heavier. Therefore in choosing the right size objective lens also means you have to compromise and trade-off. Objective lens size of 50mm and above and high magnification are very good for long distance viewing and much suitable for low light conditions. However, they often require support in order to keep them steady. Binoculars with objective lens size between 40mm-50mm are full sized and these are considered by many to be the optimum balance of low light performance and portability. The 30mm-40mm size objective lens is considered mid-sized and the offer reasonable brightness and the last but not the less are those between 20mm-30mm. They are extremely portable but gives a poorer low light performance. 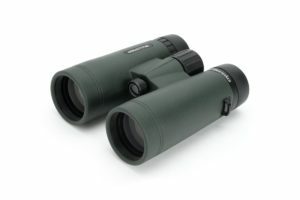 Recommended: 42mm and 32mm objective lens diameter binoculars. They offer the best balance of brightness and portability for extended periods of hand-held use in the field. To safeguard your binoculars against internal fogging and potential water damage, it is often wise to choose one that is purged with inert gas such as nitrogen or argon and O-ring sealed. This way, you can have your piece of mind when using them in extreme weather conditions like rain or wet environment. The field of view tells you how much of the target area you will be able to view at once when you look through your binoculars. In the birding game, wider field of view is desirable. It allows you to scan a wide area quickly and keep track of fast-moving objects. This feature is often expressed either in meters or in feet. The bigger the number the better. The proper lens and prism coating can transform the optical performance of any binocular. 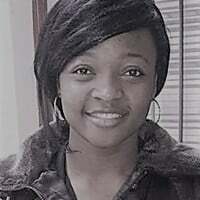 Thus the fact. there are different color and degree of coatings you will find on the market today. When it comes to the coating, the more coatings there are on a binocular the better its optical performance. The coatings enhance light transmission, image resolution, color aberration, contrast, and fidelity. 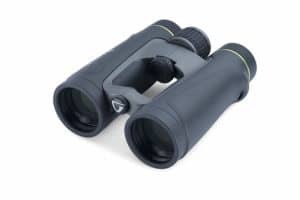 There are many other features one can look out for when selecting a bird watching binocular, but these are the basic and tips which will lead you to find the right pair for yourself. Now, let’s look at our top budget-friendly birding binoculars. Wingspan is an American company that has position itself as the best company for providing affordable binoculars for bird watching for the middle class. These binoculars are specially designed with features that best sue bird watching enthusiasts needs. The Wingspan Optics WideViews HD is one of the best budget binoculars under $200 for birding. With a wide field of view of 430ft at 1000yrds and close focus of 2m, you can view an entire flock of birds at once this these while also enjoying the finest of details on a close focus. 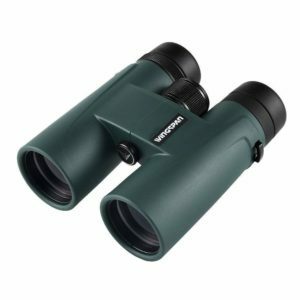 These Wingspan 8×42 binoculars feature fully multi-coated lenses and phase-corrected roof prism to help create sharp, clear and bright images. This is another pair from Wingspan Optics that delivers ultra-sharp, clear, and bright images whether you are far away or close up. With a wide field of view of 430ft at 1000 yards and close focus of 2m, you can definitely see view amazing things with this pair. Whether you are taking them bird watching or wildlife viewing, you won’t regret with these binoculars on your side. With their anti-slip grip, you can hold them comfortably in your hands without fear that they might slip and fall. These are also fully protected against water and fog damages. Making them fog proof and waterproof. They are also ergonomically designed with an easy turn on focus wheel which makes it easy to enjoy hours of bird watching. Nikon is one of the respected brands worldwide and has some of the best and affordable binoculars in the market today. 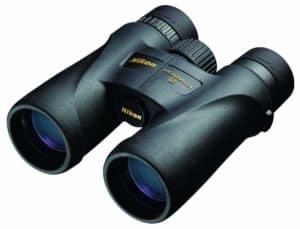 the Nikon Action Extreme All Terrain binoculars in its own right comes as one of the best budget binoculars for your outdoor activities. The Monarch ATB features dielectric high reflective multilayer BAK4 prism glass and fully multi-coated lenses that produce brighter, sharper and crispier images and improve low light performance. Field of view is at 430ft at 1000 yards and it has a generous eye relief to accommodate even though who wear eyeglasses. 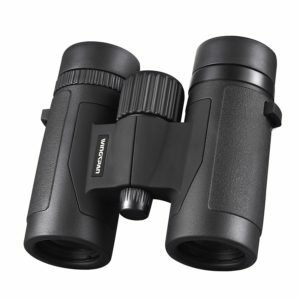 This Celestron Nature DX binocular has a nitrogen-filled polycarbonate housing that is built to withstand heavy rain and deliver fog proof performance, which makes this binocular ideal for your bird watching and other general outdoor adventures. This pair is designed for close to mid-range observations. Weighing less than 2 Lbs it’s lightweight and compact enough to take on your day packing. Its optics are fully multi-coated and it has phase corrected BAK4 prisms that enhance clarity and color fidelity. It has a field of view of 388ft at 1000 yards and a 2m close focus that makes it great for birding. Looking for something more compact and pocket-sized?. Then the Wingspan Optics Spectator 8×32 binoculars for bird watching would be perfect. With over 1000 verified customer reviews and been rated 4.6 out 5.0 stars, this indicates that the majority of the customers are happy with their purchase. These are not only for birding but also can be used for other outdoor activities such as sports events, nature watching and other activities. 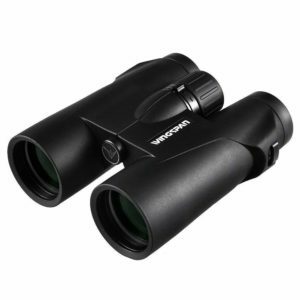 With a field of view of 362ft/1000 Yds and close focus of 3m, you can enjoy viewing with them. The Nikon Monarch 5 has better optical performance and is lighter than the Monarch 3. Made with extra-low dispersion glass lenses and dielectric high reflective multilayer prism coatings to enhance light transmission which then gives better color reproduction and clear natural looking image. These Vanguard binoculars have met all the basic criteria for bird watching binoculars. with a wide field of view at 340ft at 1000 yards and a close focus of 6.6feet, these surely won’t disappoint you. 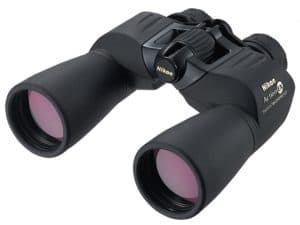 The 10×42 Endeavor ED Binocular from Vanguard offers an ergonomic, open-bridge design with a large, ridged, central focusing knob for less weight and greater comfort. Glass coatings make binoculars always better. This pair features fully multi-coated extra-low dispersion lenses and BAK4 prisms. The coatings reduce color dispersion while providing high-resolution color images with increased light transmission. Nitrogen filled and O-ring sealed, the Endeavor ED is water and fog proof to take on challenging weather conditions. Bird watching doesn’t have to be expensive as you can see. Binoculars are indispensable when it comes to birding. With the above featured best budget binoculars for birding, you can spend less and still have a wonderful experience on your bird watching adventure. With just $200 or little above that, you can get a good pair of binoculars that will give you decent images for less money.